Surprise your group with Valentine's Day soap, a Valentine's Day mailbox, Valentine's Day crafts, and so much more! 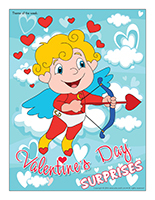 Puppets, thematic letters, Valentine's Day cards, posters, Cupid tracks, and printable arrows for a surprise-filled week. (Open thematic poster-Valentine's Day-Surprises) Print, laminate, and display all kinds of posters. (Open puppets-Cupid) Print the puppet and use it to present the letters to your group. Prepare a special Valentine's Day mailbox. You can deposit the letters in this mailbox each morning before children arrive. Read the letters to your group and enjoy the suggested challenges and activities. 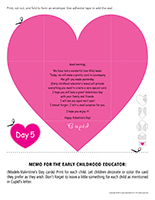 (Open thematic letter-Valentine's Day-Surprises-Day 1) Print and hide the letter and invite children to search for it during circle time. Read it to your group to introduce this special week of Valentine's Day activities and surprises. My name is Cupid. I am a child like you, but I have wings! Yes, you heard right. I have wings. Do you know what my favorite pastime is? I like to launch love-filled arrows to fill hearts with love. Did you know that there are many ways to love someone? You can love a boy or a girl, you can love your parents, you can love a toy, etc. Of course, we don't love a toy the same way we love our parents. I have come to have fun with you as we wait for Valentine's Day. Throughout the week, I have several activities and surprises in store for you. Every day, (early childhood educator's name) will read a letter suggesting something special for you to do to prepare for Valentine's Day. If possible, please set up a special corner just for me within your daycare. I can't wait to see my special corner and your Valentine's Day decorations. 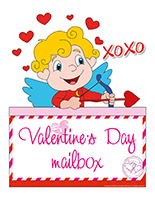 Purchase the mailbox available on the educatall.com online store and decorate it for Valentine's Day. Use a cardboard box (shoebox, cereal box, etc.) and transform it to make it look like a mailbox. Decorate it for Valentine's Day. Recycle an empty metal or plastic coffee can and transform it to turn it into your Valentine's Day mailbox. Hang a gift bag on a hook or door handle. Identify it so people know it's your Valentine's Day mailbox. (Open Cupid tracks) Print, laminate, and arrange the illustrations on the floor to create a path that leads to different areas frequently visited throughout the day, including your mailbox corner. (Open Thematic letter-Valentine's Day-Surprises-Day 2) Print the letter and prepare a special Valentine's Day soap as well as a special Valentine's Day box to surprise your group. I thought I would surprise you today by preparing my special Valentine's Day soap. Today, have fun creating a love-filled daycare décor. Use the contents of the box I left for you to decorate your daycare. I look forward to seeing how you used the items! Prepare your special Valentine's Day soap prior to children's arrival and fill a box with Valentine's Day decorations and arts & crafts materials. Encourage your group to use the contents of the box to decorate your daycare. Cinnamon, vanilla, or chocolate-scented soap. Soap bottle filled with clear soap to which you have added two drops of red or pink food coloring. Clear soap bottle and soap to which you have added tiny red objects. Liquid soap to which you have added glitter. Contents of your Valentine's Day craft box: Pink, red, and white waxed crayons, wooden colored pencils, and markers. Prepare a few pots filled with a mixture of glue and red food coloring. Fill small containers with metallic confetti, stickers (hearts, Cupid), and red, white, and pink feathers. Also offer all kinds of paper (tissue, crêpe, metallic, cellophane, etc.). (Open thematic letter-Valentine's Day-Surprises-Day 3) Print the letter and deposit it in your Valentine's Day mailbox. I am back! I spent the entire night launching arrows to make sure people continue loving each other. I am very tired this morning. I know you can't fly around or launch arrows to help me, but you could think of kind words and hang them on a special Valentine's Day ribbon. I left a few arrows with your early childhood educator. She will help you hang them. Use the arrows to make someone smile. If you are lucky, you will receive one too! Hang a piece of pretty ribbon within your daycare, like a clothesline. You can use it to display children's arrows. (Open love arrows) Print the arrows and encourage children to tell you kind words they would like to send to someone special. Write their words on an arrow. Use red clothespins to hang the arrows. If you wish, invite parents to write a special message on an arrow for their child. Read the messages for the children in your group during the day. Variation: If you prefer, invite children to draw on the arrows. (Open thematic letter-Valentine's Day-Surprises-Day 4) Print the letter and deposit it in your Valentine's Day mailbox with a tiny bag filled with cinnamon hearts before children arrive in the morning. On Valentine's Day, it's fun to share special treats and surprises with people we love. Today, I thought it would be fun to make a simple gift for your parents or another special person. I left instructions with (early childhood educator's name). She will provide everything you need to create a special scented heart. Make scented hearts with the children in your group. (Open models-Heart) Use the model to trace two hearts per child on felt. Cut out the hearts and layer them one on top of the other. Use a hole-punch to make holes all the way around the edge of the hearts so children can use yarn to "sew" them together. Before completely closing their heart, let children stuff it with potpourri or cinnamon hearts. Tie a knot with the yarn and you will have a great gift for parents. (Open thematic letter-Valentine's Day-Surprises-Day 5) Print the letter and leave it in your Valentine's Day mailbox corner with a tiny surprise for each child. We have had a wonderful love-filled week. Today, we will make a pretty card to accompany the gift you made yesterday. (Early childhood educator's name) will provide everything you need to create a very special card. I hope you will have a great Valentine's Day with your family and friends. I will see you again next year! I almost forgot...I left a small surprise for you. I hope you enjoy it! (Models-Valentine's Day cards) Print for each child. Let children decorate or color the card they prefer as they wish. Don't forget to leave a little something for each child as mentioned in Cupid's letter.